Electronic Arts is releasing a bit of an unusual tie-in to the upcoming game Dante's Inferno: A special trade-paperback edition of the real Inferno, the first part of Dante Alighieri's epic poem The Divine Comedy. EA has partnered with Del Rey Books, a Random House Publishing Group imprint that specializes in science fiction and fantasy, to commemorate the launch of Dante's Inferno with a new release of the famed 14th century poem that inspired the game. 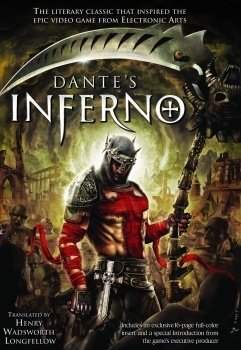 The book will feature an introduction by Dante's Inferno Executive Producer Jonathan Knight and 16 pages of full-color art, but unlike the game, this Inferno is the real deal: You won't find Dante wielding Death's scythe or kicking the crap out of the denizens of Hell anywhere in the pages of this book. "Through the creative process of developing this game, we have grown quite close to the literary works of Dante Alighieri. It is his vision that we are adapting for this new media, and new audience," Knight said. "The game is a celebration of Dante, and we hope gamers will be encouraged to go beyond the game and explore the classic text that has inspired us so deeply." "Visceral Games and EA have provided us with an amazing opportunity to bring one of the great works of classical fiction to a new group of fans," added Michael Braff of Del Rey. "Their stunning and inventive take on Dante's Inferno will be sure to wow players around the world and we are extremely proud to be able to provide those individuals with insight into the creative processes involved in adapting Dante to a new medium." EA's special Inferno trade-paperback ships to booksellers across the U.S. on January 19, while the Dante's Inferno videogame is scheduled for release on February 9 for the PlayStation 3, Xbox 360 and PSP.